Gfest: 'BATMUPPET FOREVER' Movie Poster is Two-Facerrific! 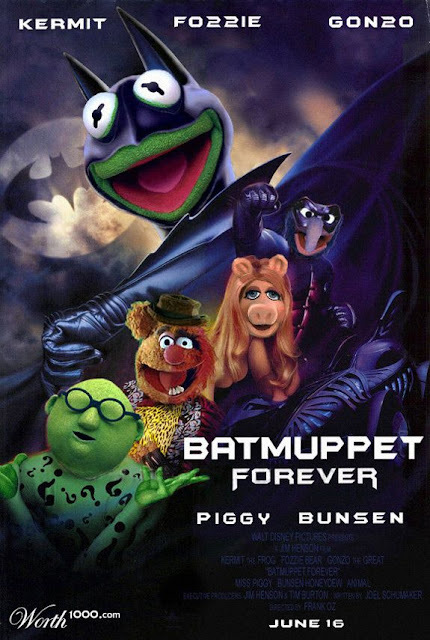 'BATMUPPET FOREVER' Movie Poster is Two-Facerrific! Thanks to artist CCZ at Worth1000 for this Batman Forever/Muppet Mashup movie poster. It is utterly hilarious, especially Fozzie (and Animal) as Two-Face. You can tell this great mashup has been around for a while but it is definitely worthy of a second look. I love that Two-Face is half Fozzy and half Animal! AWESOME! This one is really looking just fantastic and awesome movie poster. I am highly impressed to see this one. As the design and look of this one is really looking interesting and impressive. Thanks for sharing.